Messmer’s UV Plus Messmer’s UV Plus is a premium deck stain and natural wood finish which protects and beautifies exterior wood decks, siding, fences, log homes, and other wood projects. NOTE: All color samples approximate actual stain colors as accurately as possible. 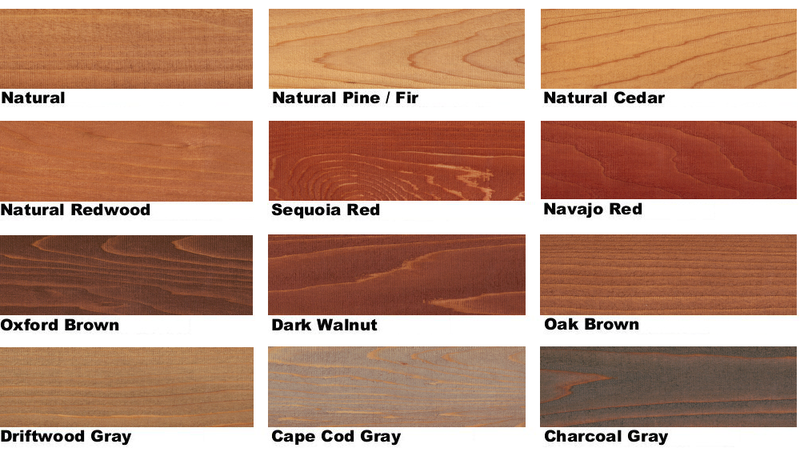 All woods, regardless of species, will vary in grain and color from one piece of wood to another. Therefore, a sample brushout on a trial area is suggested before proceeding with entire job. These samples are intended for use as a general color guide only. UV Plus is a penetrating deck stain, wood stain and oil finish that beautifies and protects exterior wood, providing a natural appearance. 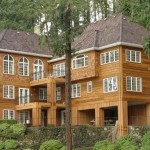 It is ideal for use on cedar, pine and redwood and comes in a variety of tones and semi-transparent colors. UV Plus contains fungicides and UV absorbers of the highest quality. It does not form a surface film when properly applied and is not subject to peeling and flaking. To recoat, just clean and/or brighten the wood surface and reapply UV Plus. No stripping or sanding is necessary. On vertical, smooth surfaces, UV Plus can be expected to last for 2-3 years, on rough surfaces, 3-4 years and on decks 1-2 years. The time element will vary depending on conditions such as sunlight, weather and direction of exposure. I want to keep my wood looking natural? Should I use a clear finish? Clears with no pigmentation do not offer UV protection or color retention. Our products contain Transparent Iron Oxide pigments which absorb UV radiation while allowing visible light to pass through. This results in a finish that highlights the natural beauty of the wood while still protecting it. We suggest using our transparent finish that is designed for the type of wood, such as Natural Redwood for redwood, Natural Cedar for cedar, and Pine/Fir for pine or douglas fir. This allows you to maintain a natural look and provide extended color retention and protection to the wood. After I applied UV Plus, there are areas that are shiny and tacky. What happened? How do I fix it? This is usually caused by oversaturation of UV Plus on the wood. Remember, UV Plus must be able to penetrate completely to work properly. Remove any excess material promptly. Within 48 hours of application, scrub affected areas with lacquer thinner or MEK solvent to soften excess material. Wipe dry. If product has cured to the point that this does not correct the problem, excess material must be removed by chemical stripping or sanding. Dispose of clean up materials according to local, state and federal regulations. Another cause of shiny tacky areas is applying the product to wood that is too damp. An oil based product applied to a wet deck will not penetrate very well, as the oil and water don’t mix. Make sure that the deck is thoroughly dry before applying any oil based product. Lumber that may appear to be dry or dry at the surface can still have a high moisture content that may “push” the oil back out if the boards are heated up by the sun later in the day. Can UV Plus be applied over another stain? Yes, provided the previous finish has sufficiently weathered to allow penetration of UV Plus. For best results, clean the surface with WD Wood & Deck Renewer, Wood & Deck Cleaner and Brightener, or sand to a new surface. What is the proper temperature to apply UV Plus? We recommend surface and air temperatures between 45F and 90F. Avoid application in direct sunlight on hot days. 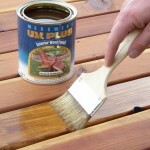 If the wood is hot to the touch, it is too hot to apply UV Plus. How long should I let my deck weather before applying UV Plus? 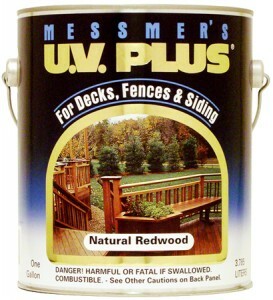 Redwood decks should weather six to eight weeks minimum before applying UV Plus. The wood needs to weather sufficiently to allow the pores to open up to accept the stain. Failure to do so will cause premature failure and possible surface sheen problems. Why doesn’t UV Plus bead water? Water beading is accomplished by adding waxes or paraffin to the stain. These additives do not last very long and are not good permanent water repellents, in addition to this they interfere with adhesion should you decide to paint over the stain. That’s why we don’t use them in our products. The high solids content of UV Plus fills the pores of the wood, providing excellent water repellency that will last. The weather report predicts rain tomorrow. Can I finish my deck today? We wouldn’t recommend it. UV Plus needs at least 24-48 hours to dry in good conditions. If a newly stained deck is rained on, the rain can force the stain up out of the pores of the wood, leaving a blotchy appearance. It’s best to wait until there is no precipitation expected for 48 hours. In some regions, this may mean waiting for a different time of year to finish the deck. Is UV Plus suitable for vertical surfaces? Can it be used on log homes? Absolutely! 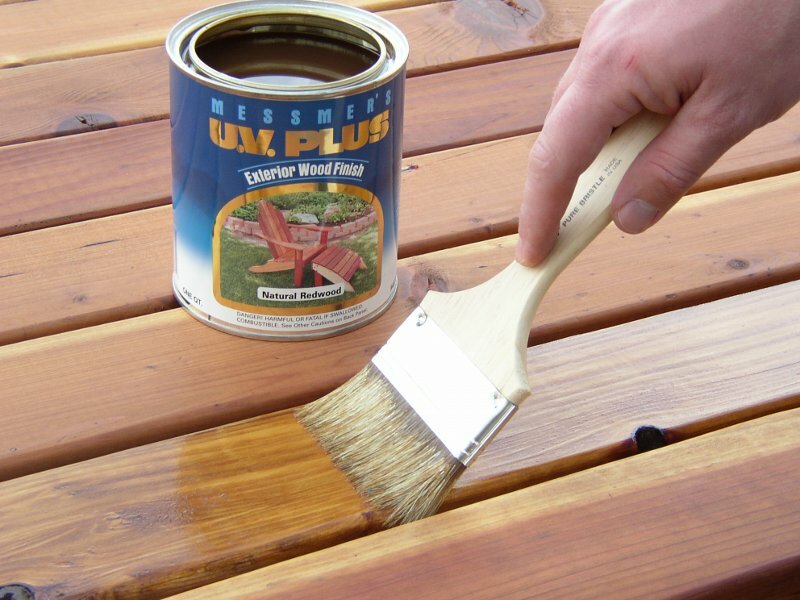 UV Plus is an excellent choice for almost any exterior wood surface, including vertical surfaces. It can be used on siding, log homes, and wooden shakes. Make sure the surface is clean, dry, and any previous coatings have either weathered away or been removed. Do not use UV Plus over paints or other film forming coatings, it’s designed to penetrate into bare or weathered wood surfaces. I want a shiny finish. Can I put multiple coats of UV Plus on the wood? No. The only way to get a shiny surface on the wood is by using a multiple coat, film forming finish. We don’t recommend clear film forming finishes on decks because they are slippery when wet, they will eventually peel, and they are difficult to maintain and recoat. When properly applied, a penetrating finish like UV Plus will not be shiny, it will have a natural, matte look. For a glossy or satin appearance on vertical surfaces, we recommend our Timberflex products. Can I use UV Plus on pressure treated wood? A: Yes, UV Plus works great on pressure treated lumber. If you’re working with new wood, it’s best to let it season for several weeks to allow it to dry out and stabilize. EPA studies show that applying an oil based, penetrating sealer to CCA treated wood will reduce leaching of harmful chemicals in the wood. 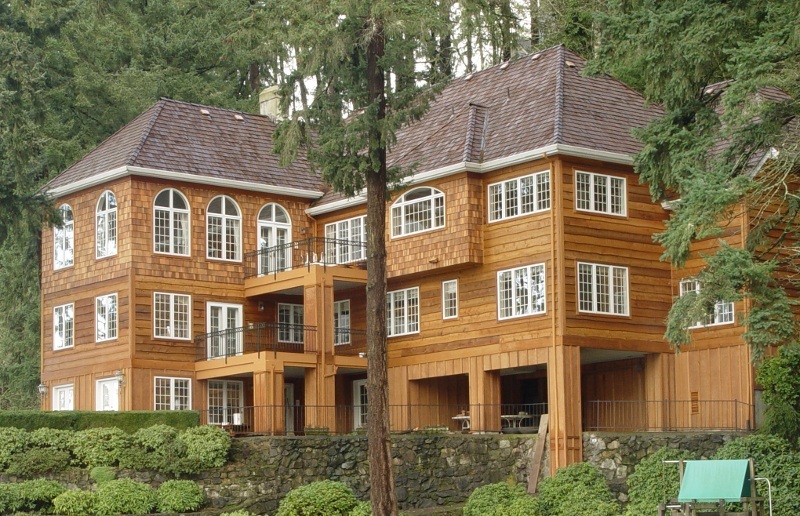 CCA lumber for residential use was phased out in 2004 due to health concerns, but UV Plus is suitable for all other commonly used types of pressure treated wood, including ACQ and copper azole.